The White Beach Naval Facility is a staging area for Marines and their equipment based on Okinawa, Japan. 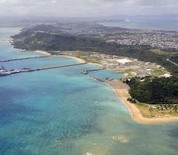 The port is located on the Katsuren peninsula and has two piers which provide anchorage, pier service and replenishment to Seventh Fleet amphibious units. White Beach is a facility under the Commander, Fleet Activities Okinawa (CFAO), which is headquartered on the north side of Kadena Air Base.